Michael Taylor was a silk merchant in Edinburgh whose wife and daughter were poisoned by his son-in-law, Dr Edward William Pritchard. Pritchard and his wife, Mary, lived in Glasgow, where he practised as a doctor. In 1865 Mary was unwell, so her mother, Jane Taylor, went through from Edinburgh to look after her. In February Mrs Taylor died, and Dr Pritchard signed the death certificate. He then accompanied the body to Edinburgh where she was buried in the Grange Cemetery. Less than a month later, Mary also died. Following an anonymous tip off, the police exhumed the body of Jane Taylor, and it was found that both women had antimony poison in their systems. Pritchard was found guilty of their murders, and was hanged on 28 July 1865, the last man to be publicly hanged in Glasgow. The case was a sensation at the time. It was thought that Pritchard was having an affair with a servant girl, Mary Macleod, and that his mother-in-law had caught them together. Mary, who was 15, became pregnant, and Pritchard arranged an abortion. She was cleared of any involvement in the crimes. Michael Taylor was born in Kirkby Stephen, Westmoreland, on 3 November 1793. 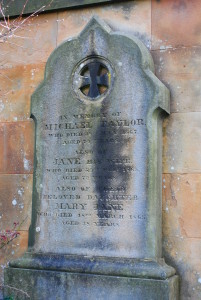 He married Jane Cowan (1792-1865), and Mary Jane Taylor (1825-1865) was born on 28 December 1825 in Duddingston, near Edinburgh. Mary met Edward Pritchard in Portsmouth, marrying him in London on 17 September 1850. By the time they moved to Glasgow they had five children. Jane Taylor was 73 and Mary was 38 when they were murdered. Michael Taylor died two years after the murders at the age of 74. 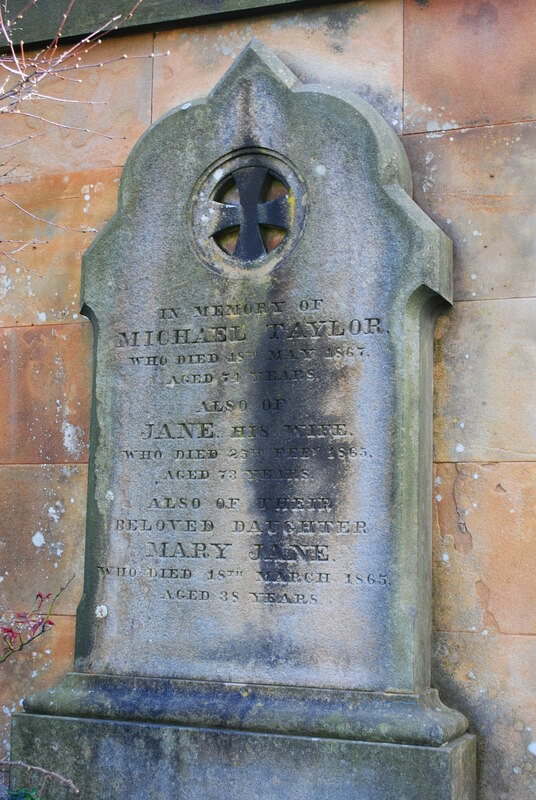 The headstone in Grange Cemetery is very simple, just giving the names of Michael, Jane and Mary, the date they died, and their ages. Another murder victim lies in an unmarked grave in the Grange cemetery. She is Elizabeth Dyer, who was poisoned by her husband, Eugene Marie Chantelle in 1878. 2. The Scotsman newspaper, March-July 1865.